When going to the gym, I don't particularly like going with a bag. The less I have to worry about there - the better! That means the more I can focus on working out. 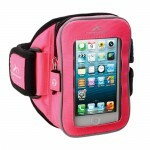 I always seem to have trouble finding something to put my iPhone in when working out. There are a ton of options, but I have yet to find an armband that not only fits around my (skinny) bicep - but that stays put! I was giving the opportunity to review and test the Armpocket! They truly are the ultimate armband! Not only are they comfortable and a cool color - but I can fit my gym key in it, a chapstick, and my license! That's in addition to my headphones and iPhone, as well. If you've been like me and you've searched high and low for an armband that works - look no further. Disclaimer: Orca Communications Unlimited sent me a sample of the product for my honest, unbiased opinion. All opinions are my own. Thats pretty awesome.. i do need to get one.